Microsoft Word 2007 has built-in bibliography/citation tools to make properly formatting citations and bibliographies as easy as it can be; all you have to do is provide the information, and tell Word how you want it formatted. 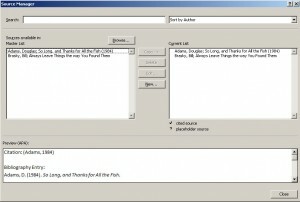 It works with a number of different formatting styles: APA, MLA, Chicago, and a number of others. All of this is located under the Reference tab, in the group called Citations & Bibliography. Before you can do anything, you need to add your sources. 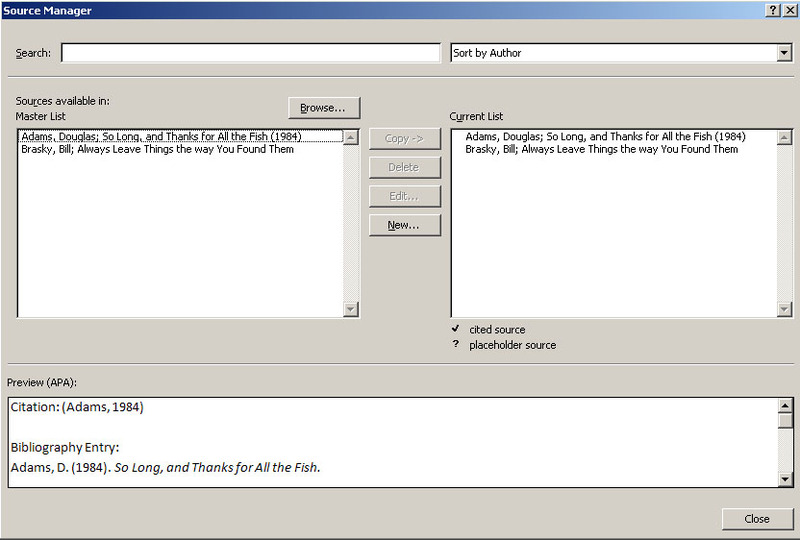 In the Citations & Bibliography group, click Manage Sources; this will bring up the Source Manager. From here, you can add, edit, remove sources, search through your sources by author, title, date, etc. There are two lists, the Master List, and Current List. The Master List is a list of all the sources you’ve ever added, in any document. The Current List is what gets put into your bibliography (it’s the sources you’re currently using in this document). Below the lists is the Preview field. It shows you what the sources will look like in any given style. Click on New, and it the Create Source dialog box will open. At the top, you can select the source type, and below it are the common fields for a bibliographic entry (author, title, publisher,year). You can check the “Show All Bibliography Fields” checkbox on the left, and it will give you all of the available fields. If you need to edit any of your sources, just highlight it in the Source Manager, and click Edit. It will bring up a dialog box similar to Create Source. So now you’ve got your sources created, and put into the Current List. Whenever you want to add a citation, click Insert Citation, and it will open a list of your sources. Just click the one you want to add, and it will insert a citation wherever you want it. This is perhaps the easiest part of the whole process. Wherever you need to put your bibliography, click the Bibliography button. A menu will open with a few built-in bibliography pages, which will insert your bibliography with a title of “bibliography” or “works cited”. At the bottom, if you click Insert Bibliography, it will just insert the sources.